Preschool aged children find themselves in a time where curiosity and the need to learn is vital. 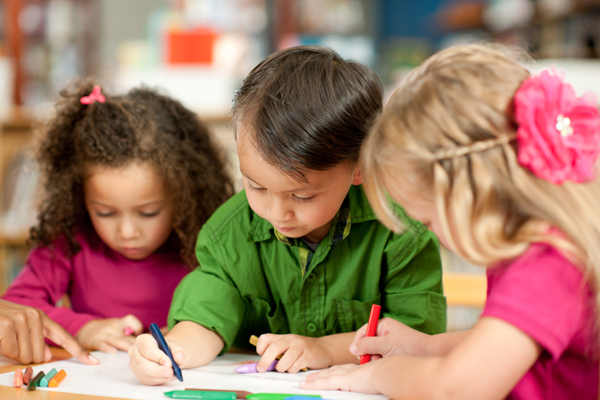 Our highly experienced staff knows that preschool aged children grow and learn at a very fast pace; it is our job to provide every opportunity through which they can develop intellectually, emotionally, and socially. We accomplish this by providing a curriculum that focuses on early literacy, math, science, and social studies concepts. As we begin to introduce new concepts and ideas we provide guidance and positive reinforcement to help create lifelong learners. Our age specific facilities lend themselves to the unique curriculum that our Preschool program offers. As preschool aged children become increasingly more mobile and independent we spend more time outside in our secure playgrounds to encourage active play. We encourage independent exploration, hands on activities, and more group activities. As always, our staff is dedicated to providing you with insight into your child’s day-to-day activities and continuing development. We are excited to be a part of your child’s important developmental years.